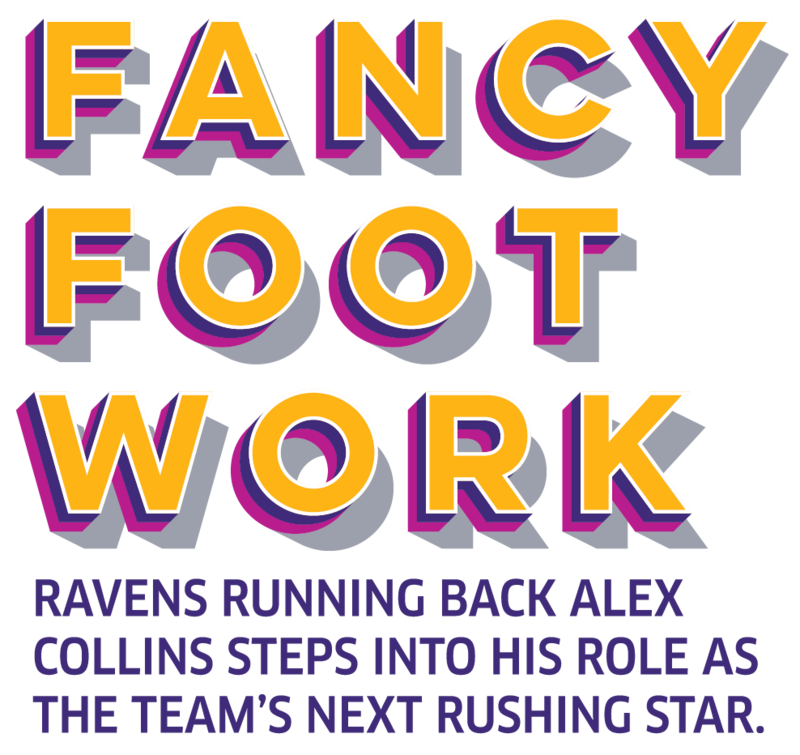 lex Collins assumes the ready position: standing straight up, he pulls his shoulders back and places his right foot on the ground in front of his left so they form a zigzag. He’s wearing his purple No. 34 jersey, black shorts with black leggings, and white cleats, but on his face is not the scowl of an NFL running back about to attempt to elude 11 defenders intent on inflicting upon him severe physical punishment, but a broad smile. There’s no music playing, but Collins eases seamlessly into his routine anyway. After more than two years of taking Irish dance lessons, the steps are second nature. His spikes clack against the wooden floor of the makeshift photo studio, his legs kick forward, then backward while his hands remain fastened to his hips. As his dreadlocks whip through the air, his toothy grin never fades. Believe me, it isn’t. Not for an in-decent-shape, 42-year-old, desk-bound writer like myself (more on that later), but not even for a world-class athlete like Collins. It took him a month until he could execute the most basic of moves to the speed of a song, and he has years to go if he wants to achieve the level of success on a stage that he has already reached on the football field. With 973 yards and six touchdowns last season, Collins emerged as one of the league’s best backs. 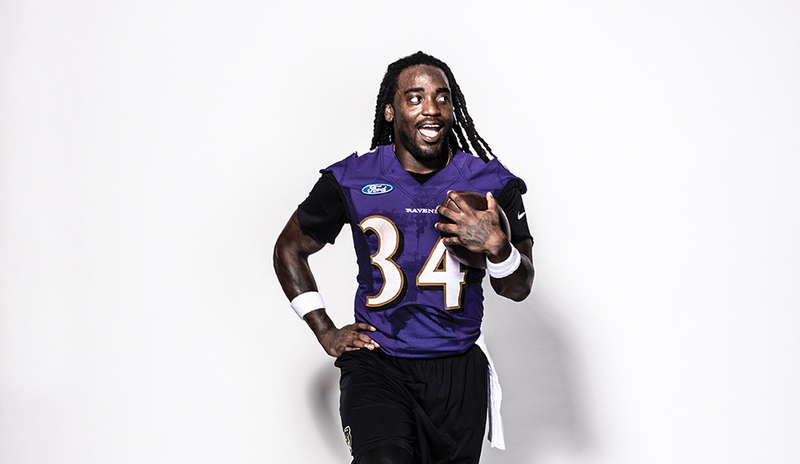 That he’s willing to put in the hard work, to leave his comfort zone, to make himself vulnerable in front of a public that often demands its athletes live solely in a narrowly defined box of masculinity, speaks to why he is where he is today—on the precipice of becoming the Ravens’ next rushing star. To the photographer he turns and proffers a request. Collilns shows off the Irish dance. Collins is a bit more reticent when talking about his upbringing. He grew up in Fort Lauderdale with four brothers and one sister. Both of his parents are still part of his life, but according to his college coach, Bret Bielema, his relationship with his father, Johnny, was so fractured that Collins didn't even know the origin of his old childhood nickname, Budda, was Buddha—the iconic founder of Buddhism and reputed vessel of good luck. Sports were at the center of life in Collins’ neighborhood, and the competitive nature of the games helped mold him into who he is today, he says. In high school, he played basketball, lacrosse, and ran track. It wasn’t until his junior year at South Plantation High School that he suited up for the football team. Douglas Gatewood was the Paladins’ coach when Collins transferred in as a ninth grader. Already sporting a beard and his now trademark dreadlocks, Collins looked significantly older than your average freshman. His physical appearance overshadowed a sunny, sweet disposition that gives everyone who meets him the feeling that they’re his friend, Gatewood says. He should know—he was captivated by Collins’ personality as well. The teenage Collins spent so much time hanging out at their home that today he refers to Douglas' daughter, Bryanne, as his sister, and the Gatewoods as family. The feeling is mutual. The first time he saw Collins on the field was during a spring conditioning drill. Gatewood immediately recognized his “ungodly” talent, but it took longer for the rest of the football world to take note. When Thomas Hammock, then an assistant coach at the University of Wisconsin, first watched tape of Collins, the running back had no scholarship offers, and Hammock couldn’t understand why. Choosing a college can be stressful for any talented high school athlete (or a regular student, for that matter), but for Collins it turned out to be especially nerve-racking. His mother, Andrea, desperately wanted him to stay close to home, but Collins was lured by the unknown. Collins wanted to attend the University of Arkansas, where Bielema had just become the head coach. Knowing his mother’s opposition to her son leaving the state, the Arkansas coaches sent three sets of scholarship papers to South Plantation for signing day. The extra copies came in handy. Accounts of the episode—some more factual than others—lit up the internet, and the story was covered on ESPN. Where other kids would have panicked, Collins dealt with the situation with a maturity beyond his years. Eventually Collins’ father signed the papers, and he went on to a wildly productive three-year career at Arkansas. He harbors no animosity toward his mother for the bizarre events of that day. After three straight 1,000-yard rushing seasons in Fayetteville (he’s one of only four backs to pull off that feat in the storied history of the Southeastern Conference), Collins declared for the NFL. He was selected in the fifth round of the 2016 draft by Seattle, where he spent a disappointing rookie year, rushing for just 125 yards and one touchdown. The Seahawks released him prior to the 2017 season, and he was signed to the Ravens’ practice squad. 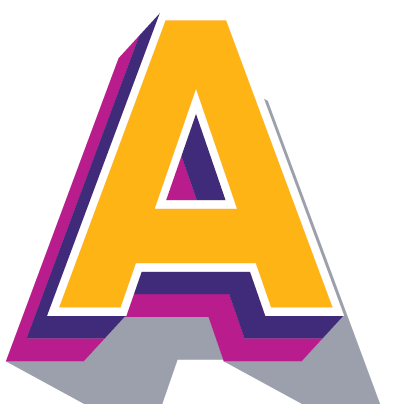 Following an injury to Danny Woodhead, he was added to Baltimore’s active roster on September 16. From his first game against Cleveland, in which he ran for 42 yards on seven carries, Collins impressed. “He has great vision and a great feel for blocks and where we are winning on our leverage,” says offensive lineman Ronnie Stanley. Ah yes, his feet. Collins’ size 11.5s are among the strongest in the game, yet when he first set foot in an Irish dance studio, badgered into it by a long-running friendly family feud with Bryanne, they weren’t quite so nimble. Collins did, and when he emerged following that initial class, he looked like he had come out of a sauna. One reason for his diligence? Collins firmly believes that his dance moves translate to the football field. 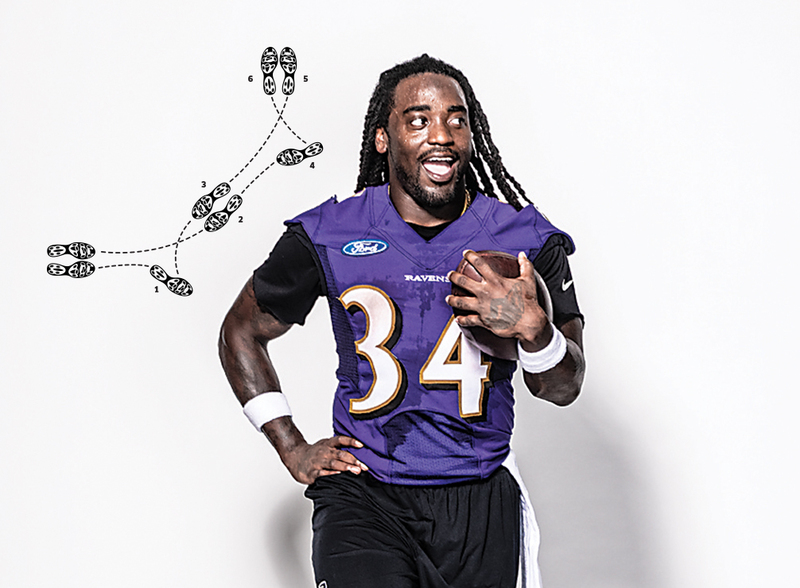 He estimates that last season he used some form of Irish dance steps on at least 70 percent of his carries. As successes began piling up on the field, Collins attracted more and more attention for his hobby. Sports Illustrated did a story, as did a media outlet in Ireland. A thousand miles across the U.S., a woman and her son caught wind of Collins’ passion, and it changed their lives. Thirteen-year-old Carl Tubbs, a huge Green Bay Packers fan, has been an Irish dancer for four years. He loves it because it sets him apart in his hometown of Des Moines, Iowa, although being different in middle school can lead to agony. Carl was down in the dumps and told his mom, Joanne, that he wanted to quit. Hoping to cheer him up, she googled Irish dancing and eventually found a YouTube video of Collins performing. She reached out to him on Twitter, and Collins extended a virtual hand back. “Never stop doing the things you love because someone else doesn’t agree. Chase your dreams Carl and don’t let them stop you from being great!” he wrote. Carl immediately perked up. The family decided to go to a Ravens game in Minnesota, and the team arranged for them to meet Collins in the locker room after the game. Irish dance company Riverdance contacted the Tubbses; in July, Carl attended the group's camp in Boston. The bullying stopped. Aaron Rodgers is now his second-favorite football player. The offseason has been busy for one of the most famous Irish dancers in America. In January, Collins competed on a CBS talent show for NFL players (and lost to teammate and opera singer Justin Tucker), and in March he went to Ireland, where he learned a new routine that he performed at the Liffey Trust Studios in Dublin. He came back with a taste for international travel (his only other foray out of the country was a rather unpleasant business trip to London with the Ravens last season) and a new touchdown dance for 2018. To ensure that he gets to use it often, Collins concentrates on football when he’s in Baltimore. During a rainy May practice, he cuts, plants, and spins during drills, putting forth 100 percent effort, even on passing plays when he knows he won’t get the ball. When Collins was home in June, he accompanied Bryanne Gatewood to a competition in Orlando. Spreading the gospel of Irish dance is one of Collins’ goals, which is why he was happy to teach me a few moves at the photo shoot. I was a challenging student. The last time I danced, I was wearing a suit and dress shoes at a friend’s wedding, wildly shimmying my shoulders to Bon Jovi’s “Livin’ on a Prayer” while holding a bourbon and ginger ale in my right hand. “Keep your legs straight,” he counseled me. “Make sure to shift your weight. Shoulders back, chin up, and smile.” That last direction wasn’t a problem—I laughed at myself throughout. After executing the steps with the agility of a, well, in-decent-shape-for-a-42-year-old-desk-bound writer, I came away with even more respect for Collins’ talent. “Anyone can pick it up, it’s just practice and repetition,” he says, although I’m not fully convinced. 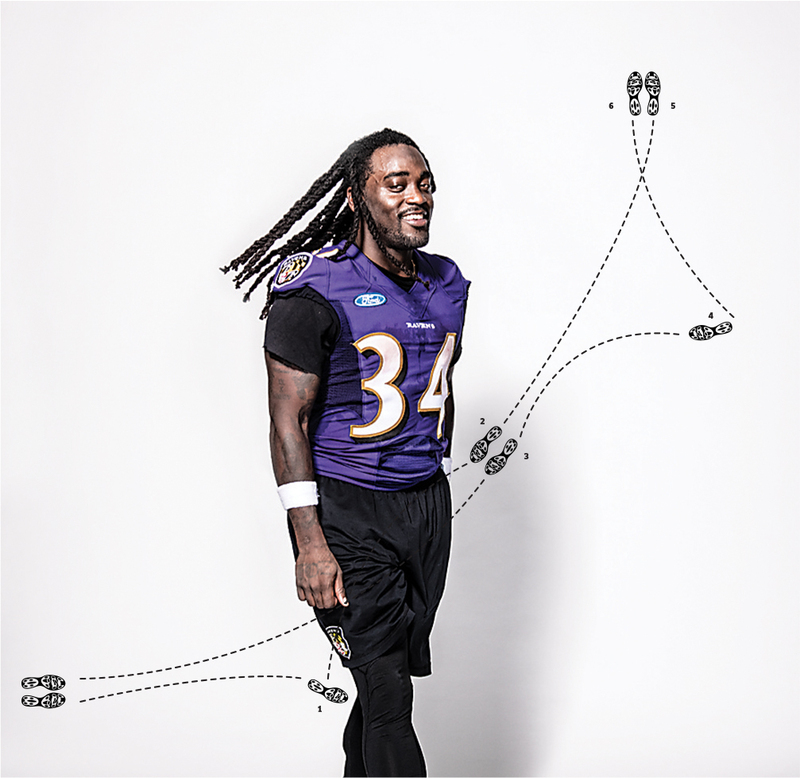 “Now it’s like muscle memory.” Clearly, Alex Collins has more muscles—and moves—than most.